The incidence and distribution of cancer of the oesophagus and stomach has changed in the last 40 years. The incidence of oesophageal cancer has increased significantly especially adenocarcinoma of the lower end. This results from an increase in acid reflux, which may cause the development of Barretts oesophagus. This condition is associated with an increased risk of malignant change. In contrast the incidence of gastric cancer has reduced particularly at the outlet of the stomach. This is likely to be due to a reduced incidence in infection with H Pylori which has a strong association with these tumours as well as peptic ulcers. The management of these cancers has also evolved with advances in diagnosis, imaging, surgery and the impact of combining chemotherapy and some cases radiotherapy with surgery. This has delivered significant improvements in outcome with 5-year survival increasing from 25-50% for patients undergoing active treatment and the mortality of surgery to well under 5%. The journey begins with diagnosis, which is the result of endoscopy and a positive biopsy. At this point you will be told the diagnosis and referred to a specialist multidisciplinary team. The advent of such teams guarantees a consistency in management. The team consists of: Upper Gastrointestinal Surgeons, Oncologists - Medical: drug treatment and Clinical: radiotherapy, Gastroenterologists – treatment of early disease, Radiologists - imaging, Histopathologists - examining any specimens, Dieticians, Physiotherapists and most important - Clinical Nurse Specialists who manage your pathway. When you come to hospital there are important initial decisions to be made concerning the stage of the cancer (more later) and the fitness of the individual. Treatment is strenuous and having both chemotherapy and surgery requires a strong constitution. In addition such cancers affect elderly patients with other significant medical conditions and treatment options may then be more limited. At all times however you will be fully involved in decisions regarding your treatment. It is crucial early in the pathway to determine the stage of the cancer. This means how deeply the cancer has invaded and whether there is any evidence of spread away from the oesophagus or stomach. If there is extensive spread (other than to local lymph nodes) then the cancer is unfortunately incurable and a major operation is not indicated. Treatment has to focus on the whole person if they are fit, with chemotherapy. CT scan - this will be the initial test which can demonstrate the size of the tumour, possible lymph node enlargement and spread of disease. PET CT scan - if the CT scan does not demonstrate any evidence of spread of the cancer then this scan is used as it demonstrates function as well as the structure of the tumour. Laparoscopy - this involves a general anaesthetic and passing a telescope into the abdominal cavity to look for tumour spread to the other organs in the abdomen. This is important in gastric cancer and cancers of the lower oesophagus. With all this information together with your fitness assessment and background medical condition your case is discussed at a meeting of all the members of the team. 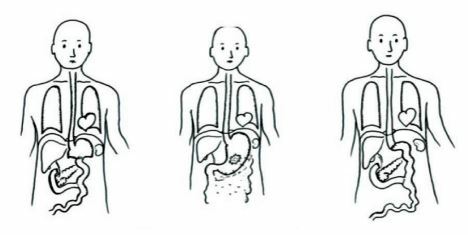 Your cancer will be staged based on the penetration of the wall of the oesophagus or stomach (T stage), the presence of involved lymph nodes (N stage) and presence or absence of distant spread to liver, lungs, bone etc (M stage). A recommendation of treatment options will be made then for discussion with you and your carers in the clinic afterwards. 1. Curative - you are fit enough to undergo treatment. The cancer is localized to the oesophagus or stomach and any involved lymph nodes on imaging will be in the operative field and can be removed or fall within a radiotherapy field. 2. Palliative - either you are not fit with high risk for surgery and/or the disease has spread beyond the stomach or oesophagus invading other structures or you have spread of disease to distant organs. Such decisions are reviewed during the pathway as you cancer will be reassessed and depending on your response to treatment decisions can be changed. In patients with disease limited to the innermost lining of the oesophagus or stomach or with the preinvasive precursor of cancer- high grade dysplasia, the lesion can be removed by an endoscope and the surrounding area treated with endoscopic radiofrequency ablation (which precisely cores out the superficial remaining abnormal tissue. The results appear to be as good as surgery with minimal risk. In the majority of cases the disease will have penetrated further into or through the wall of the oesophagus and possibly into adjacent lymph nodes. In such cases the use of chemotherapy and possibly radiotherapy followed by surgical resection is now standard practice. This followed the results of large clinical trials, which have demonstrated significant improvements in overall survival over surgery alone. Such preoperative (neoadjuvant) therapy (usually 3 cycles followed by a 6 week recovery period) is believed to work by shrinking the tumour and treating the small groups of cells that have spread from the primary tumour but are too small to see on scanning. This is the treatment pathway for adenocarcinoma, which constitutes 75% of oesophageal cancer. Depending on the findings when the specimen is removed you may have further chemoradiotherapy. In some cases of squamous cancer which is relatively radiosensitive chemoradiotherapy alone may be used. The principles are similar to oesophageal cancer in that preoperative chemotherapy is now routinely given before surgical resection. In elderly or frail patients with distal cancer who can tolerate it a resection of the distal stomach alone can be the correct treatment. If the investigations demonstrate that your cancer is advanced and spread to other organs curative treatment is not possible. This does not mean that you can’t be helped and if you have a good fitness level chemotherapy with possibly radiotherapy can give improvement in the quality and quantity of life. In addition if complications such as blockage occur, a self expanding metal stent can be placed to relieve this. In elderly and frail patients whose fitness precludes aggressive treatment help can still be given with tailored chemoradiotherapy. In such cases early involvement with palliative care specialists will be commenced to help with symptom management. The combination of chemotherapy (or chemoradiotherapy), followed by major surgery is a significant undertaking and your level of fitness is important. Diet and nutrition are central to getting through it and dieticians will have a major input to your journey. It is not just a question of getting in calories but other supplements such as iron and calcium (see our booklet on diet and eating). With neoadjuvant- preoperative chemotherapy it is not unusual for swallowing to improve with treatment and for you to gain weight. Close monitoring is however required and supplements given when needed. It is also recognized that regular exercise –prehabilitation improves outcome as does lifestyle modification especially stopping smoking. The physiotherapist helps in the case. The Clinical Nurse Specialist is central to managing your progress, dealing with issues that arise, and arranging for follow up scans and blood tests to monitor progress and response. As we are always trying to improve treatments patients are asked to take part in clinical trials in which new treatments are compared with the gold standard to either improve outcomes or reduce side effects. In such cases you may be asked to complete quality of life questionnaires, which help us assess response. Involvement in any trial is always voluntary. optimize you for surgery. The gap of 6 weeks between finishing chemotherapy and surgery allows your body to recover from the effects of chemotherapy. Patients often express concern that the tumour can regrow in this time. This is very unusual but if it does happen a major operation would be harmful and you be better treated with more chemotherapy and possibly radiotherapy due to the aggressive behavior of the tumour demonstrated by early progression. This surgery involves entering the abdomen and chest to remove the cancer with clear margins above and below which frequently involves the top of the stomach plus the associated lymph nodes. The resected oesophagus is replaced by forming a tube of stomach and bringing this up into either the chest or even the neck if necessary with its blood supply and rejoining to the proximal oesophagus with sutures or staples. There are several alternative approaches to this, which are outlined below. In addition parts of the operation are now done using keyhole surgery. There is however no proven advantage to any individual approach nor to open or keyhole surgery regarding survival, recovery or long term outcome. With specialist teams the in-hospital mortality is well under 5% and long-term survival for those undergoing surgery 50%. The experience of the surgeon/team is more important than the approach! Ivor Lewis resection - Abdomen and right chest for lower and middle third tumours. Three stage resection - Abdomen, right chest and neck for middle and upper third tumour. Left thoracoabdominal resection - Abdomen and left chest for lower third and junctional tumours involving upper stomach. Transhiatal resection - Abdomen and neck for lower third tumours avoiding opening the chest. 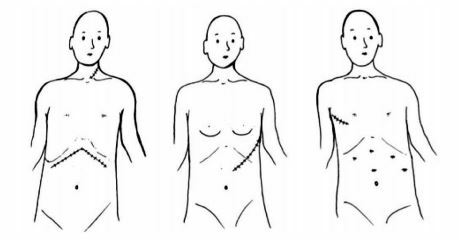 Fig 1 Operative incisions shows from left to right for a Transhiatal resection, Left Thoracoabdominal resection and Keyhole assisted Ivor Lewis resection. This is performed through the abdomen and can be undertaken either as a fully open procedure or a combined keyhole and open procedure. Again there is no proven benefit for either approach. For distal third cancer where there is a clear proximal margin of at least 5 cm between the tumour and where the oesophagus enters the stomach resection of the distal stomach leaving the proximal 1/3 is acceptable. The duodenum is closed and the small joined to the stomach to restore continuity either as a loop or a Roux en y to prevent bile reflux. If the cancer is in the middle 1/3 or proximal stomach or is the unusual linitis plastica which gives a shrunken rigid stomach, a total gastrectomy is undertaken. the resection involves the associated draining lymph nodes but routine resection of spleen and pancreas is not undertaken unless the tumour abuts the spleen when it will need to be removed. Intestinal continuity is restored, by joining the remaining stomach or oesophagus to small bowel. Following such surgery you will go from theatre to intensive care for the next 24 hours. Depending on fitness and the difficulty of surgery some patients may require a prolonged period of artificial ventilation to stabilize their condition. If there are no issues then you may be woken up in theatre prior to transfer or in intensive care shortly after. Pain relief is achieved by epidurals, nerve blocks or intravenous opiates. There are always large drains placed in the chest at surgery to allow the lung to expand fully and any blood or fluid to drain. When stable you will transfer to high dependency and then the ward dependent on progress. Good physiotherapy is crucial as is early mobilization. Chest drains are removed as soon as possible and oral intake commences usually on day 3. If there is any delay in starting oral intake of nutrition a short period of intravenous feeding will be instituted. If it is anticipated that post operative nutrition is going to be a problem a feeding tube will be inserted at surgery. Nutritional issues are especially common following total gastrectomy as unlike all the other operations there is no gastric pouch and taking sufficient volume of nutrition can be a major issue. On occasions such patients may require a long term feeding tube which may require a separate later operation to insert. Patients who undergo splenectomy require appropriate antibiotic cover and vaccinations to prevent particularly chest infections. If a total gastrectomy has been performed the patient will require vitamin B12 injections for life. The usual inpatient stay is 8-12 days. The resected tumour is sent for thorough analysis by a specialist histopathologist to determine the exact stage and response to treatment. The results if available are discussed with you and your carers before you leave or on your first postoperative visit. In rare cases at surgery the disease has progressed and is more advanced than the imaging would suggest. In such cases the operation is usually abandoned at an early stage as all the evidence demonstrates that putting an individual through such major surgery leaving disease behind reduces survival and quality of life. This is much less likely today given advances in imaging. You will be seen frequently after discharge to ensure you are making a good recovery which can take up to 3 months until you feel normal and that your nutrition is adequate. This is largely the duty of the dietician and Clinical Nurse Specialist alongside the surgeons. At this time you will meet the oncologist to discuss whether any further therapy in the form of chemotherapy and or radiotherapy is recommended This will depend on many factors including your recovery and analysis of the resected specimen. There are different views regarding the frequency and duration of follow up. It should occur as often as is required. A telephone link and rapid review if there are issues is the best practice. In follow-up emphasis is centered on nutrition and quality of life and addressing physical limitation issues. Blood test are done routinely as certain deficiencies especially iron and vitamin B12 will not be obvious in early stages but if become marked can mimic recurrence. A CT scan may be performed on completion of treatment to provide a baseline for the future should problems arise as the anatomy will not be normal. Regular annual scans are not routinely used as they can give a false sense of security. Weight loss due to inability to intake sufficient volume resulting from a loss of stomach. This is particularly so following total gastrectomy and requires close dietetic follow-up with supplements and possibly adjuvant tube feeding. Dysphagia (difficulty swallowing) due to narrowing of the join between oesophagus and either stomach or small bowel. This usually responds to dilatation. Bile reflux which is a consequence of loss of the valve at the outlet of the stomach and division of the vagus nerves. This usually improves with time but may require sleeping more upright with a foam wedge and medications such as gaviscon. Dumping and Diarrhoea arise largely as a result of division of the vagus nerves during the resection. These nerves act as co-ordinators of the gut. Changes to eating patterns and fluids plus taking sugar can help together with pancreatic enzyme supplements. They can improve up to 18 months after the operation. DO NOT IGNORE ANY OF THESE SYMPTOMS! Tell the nurse, dietician or doctor, as there are treatable causes for these distressing symptoms. These are different to cancer of the stomach and oesophagus, as they arise not for the inner lining of the bowel but from stromal tissue or muscle or nerves in the wall. They behave differently with a spectrum of malignancy dependent on size and the number of dividing cell. They can present as a mass of following a gastrointestinal bleed. Treatment if they are small, is by local excision without the need to remove large areas of bowel or lymph nodes and can usually be achieved by keyhole techniques. If they are large or have spread they are treated with imatinib or similar drugs which are a “magic bullet’ specific to the tumour.